The big, government run GTSC bus. The gelly-gelly (overloaded minibuses of various sorts). Smaller car "bush taxis" (though sometimes the gelly-gelly is also called a bush taxi). We began with the gelly-gelly. In almost all situations, the only way to find the correct gelly-gelly is to ask random people** the general direction, and then check with the young man/teenage boy at the back who's job it is to rally passengers and haul luggage onto the roof. 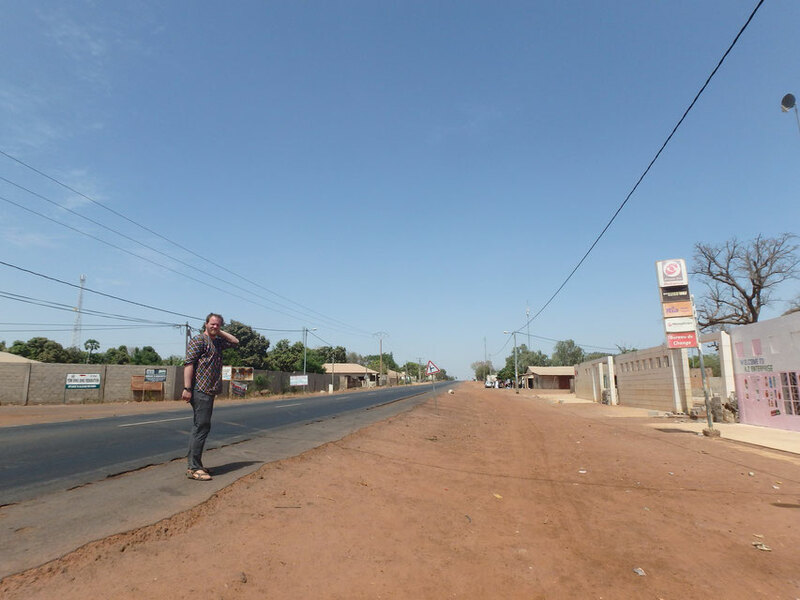 It is chaotic, but somehow, due to the overwhelming majority of kind, helpful Gambians, it never took us more than a few minutes to find the right place. The gelly-gelly itself, with its extra folding seats which fill the gangway, is cheap and actually fun for shorter journeys; we met many friendly people and were somewhat of a novelty as it seems the majority of tourists hire taxis. We found ourselves in Brikama, a "large" city of 80,000 people, in very little time. Navigating on foot was somewhat like finding the gelly-gelly - we weren't too sure where we started and there were rarely street names, but people helped us along the way. 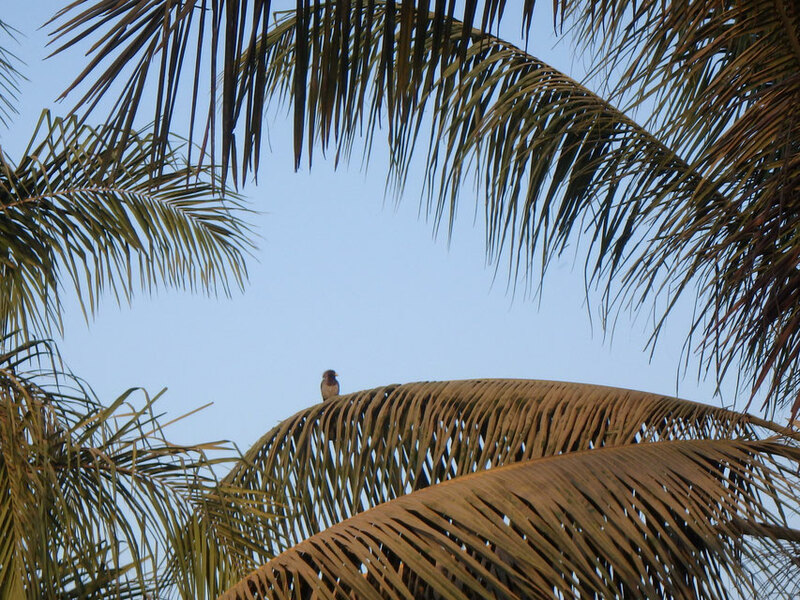 If you're looking for practical information in advance, I've now written a whole post about what to pack and how to prepare before your trip to The Gambia. In Brikama, we tried the craft market, but quickly left, clutching some small carved animals which we hadn't wanted to buy. The rest of the city was thankfully not geared towards tourists. The main market was an assault on the senses, an explosion of colours - a cacophony of cliches... Women balancing stacks of eggs on their heads, weaving through the throngs; the fish market, suffocating and carpeted in scales, scrubbed from the fish with a wooden brush of nails; traffic light stacks of chilli peppers; spaghetti piles of dusty chargers; mountains of second hand clothes; sacks of rice; push carts selling Cafe Touba (an eye-wateringly strong, scolding hot turmeric coffee); a rainbow of outfits and disabled people begging. The begging was no more intense than in Exeter, but here people responded; their reasons for being unable to work were obvious and more visible than the underlying issues back home. Sometimes I gave an insignificant contribution, feeling my stomach twist in awkwardness. We bought doughy balls and deep-fried fish pies from a woman's boiling vat. They were 1 D each (about 1.5 pence of a pound) but she still gave us one free the second time around. There wasn't a shirt big enough for Dan so the tailor offered to make one. For 550 D we came back in four hours for a perfect fit. We were happy with that, but have since done it again for 250. We went with some new found friends/over enthusiastic tour guides(?) to buy palm wine from a nearby Christian village. Here they climb the trees to tap the fermenting liquid. It was somewhere between pleasant and revolting to drink; Dan astutely compared the flavour to salad cream. With very little imput from ourselves, our day was being planned for us. Missing some vital experience-based intuition, we often found ourselves overly suspicious of purely friendly interactions or swept along by those looking for something in return; the first is more confusing, but it can be difficult to extract yourself from the second. Nobody was in the slightest bit intimidating or threatening, but feeling foolish when it became obvious that someone just saw us as a cash cow was dispiriting. 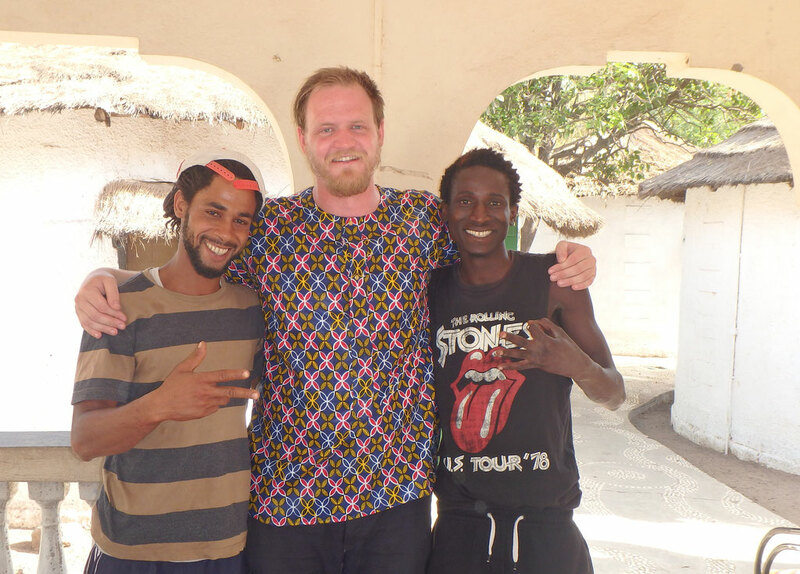 After Brikama, we lingered in Tumani Tenda, enjoying the easier relationships we had with people there. 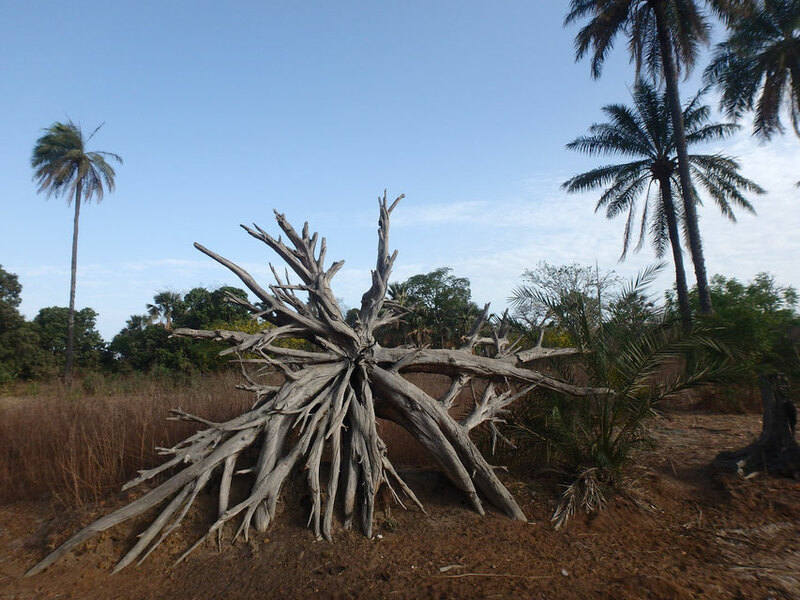 A fallen tree near Tumani Tenda. Travel "up-country" frequently gave the impression of arriving in the middle of nowhere. 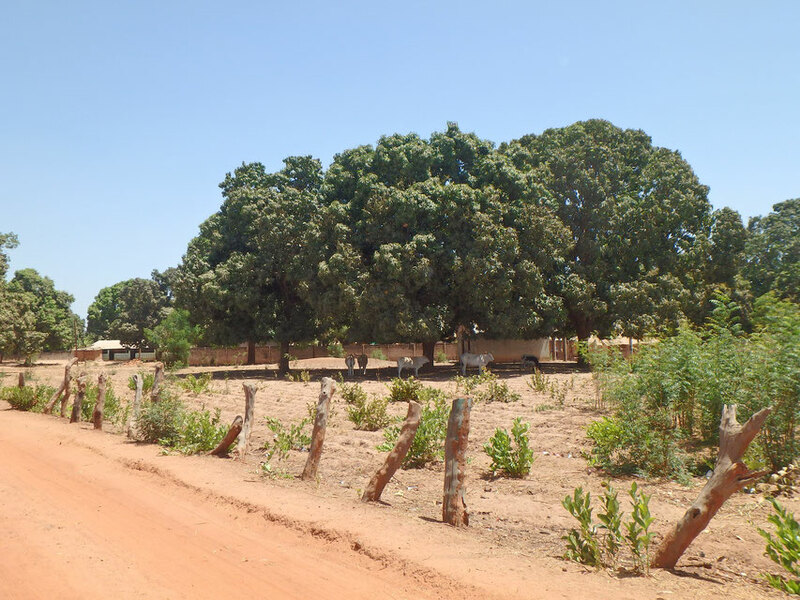 At the end of the dry season, roads were thick with dust; some plants stubborn or kept green by their carers, but they stood lonely in the sand. Houses were predominantly adobe, with concrete used for mosques, schools and hospitals. Outside of lesson hours, children flocked from the shade of one tree to another, coating themselves in dirt for their mothers to clean. Though rarely far from the bread-line, they were not the starving African children of TV charity adverts. Away from the silliness of their friends, many spoke better English than their parents, could give helpful directions or maybe tell us what they were learning in school. Generations of well-meaning tourists have instigated the idea that foreign people might be hiding sweets and, after the unanimous cry of "toubab!" (inoffensive term for foreign/white person), we often heard a hopeful "any minty?". We were not following this tooth rotting tradition, but were happy to chat and shake hands instead. Much more rarely (until we got to Janjanbureh) they asked for money which I also turned down, though a little more sadly. I have read of children skipping school to beg where many tourists are present and really didn't want to be involved in such an unhealthy relationship. As usual, the most pertinent way to help, seems to be to donate to small NGOs, charities, schools and clinics after doing some research. 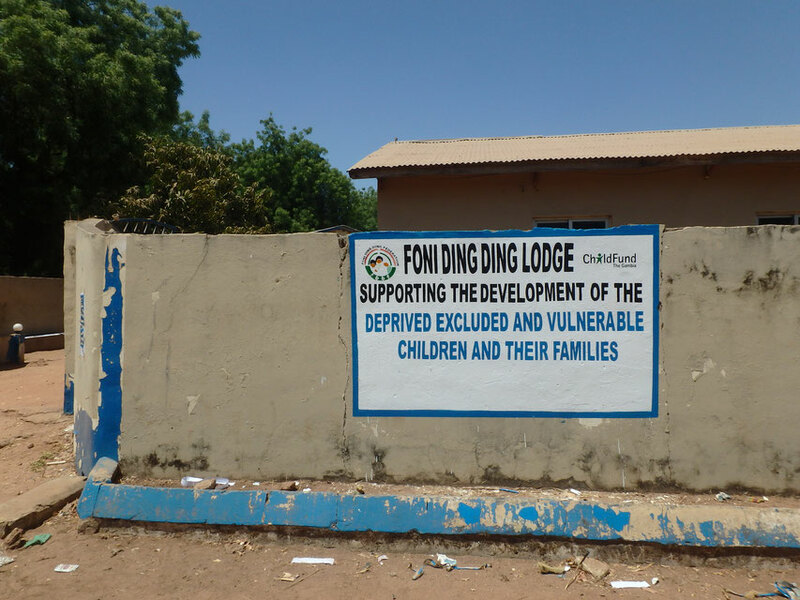 When possible, we stayed in accommodation that was community run or had links to such projects. A young man spent most of the day painting this new sign while we were in Bwiam. From Bwiam I have little to report. At the weekend, the market was quiet, some fruit, vegetables and fish, but not much we could eat without cooking. On Sunday, we were thankfully too hot to be hungry, as the best we could find was a chocolate spread sandwich and some chemical flavoured strawberry biscuits. Monday morning and through the afternoon were the same except that the man who had made the sandwiches had run out of bread; we bought stale baguettes from someone else. By seven in the evening, Dan was ravenous, so we were eager to find the town's only restaurant open. The stiflingly sweaty room, around two by three meters, was half filled with a pile of clothes and had large hand-painted signs reading "NO ALCOHOL", "NO HARD DRUGS" twice and "SOFT DRINKS SOLD HERE" above the hatch. Comically red in the face, we asked for a drink while our chicken (the only option) was being prepared. The woman, understandably irritable with a baby strapped to her back, just said no. Our food (50 D/£0.80 each) arrived - half a plate of plain spaghetti, half a baguette, a chicken drumstick and a dollop of hot chilli/onion sauce. We ate it with the correct hand and were eventually supplied with a refilled bottle of tap water - tantalising, but probably unwise to drink. The whole affair was over in half an hour and we returned, greasy and damp, to the quiet familiarity of the lodge. More from this journey in the next "episode". Bwiam - the road to our lodge. At the time of writing there are around 64 dalasi to the UK pound. **I have found older men/young women to be the best people to ask. Most young men are also helpful, but there are definitely the sort of hip twenty-somethings in sunglasses and a hat covered in cannabis leaves who might try to divert you into their friend's over-priced taxi; cue another long-winded conversation about how black and white are all the same to him and we are brothers and sisters and possibly "it is just charity man" or something about me being the "boss lady" and him making the price a little smaller (but still three times too much) for me. It's fine, but a bit exhausting. Older women can also be friendly, but are generally less likely to speak much English. See my previous posts on highlaccommodation Sanyang and Tumani Tenda. 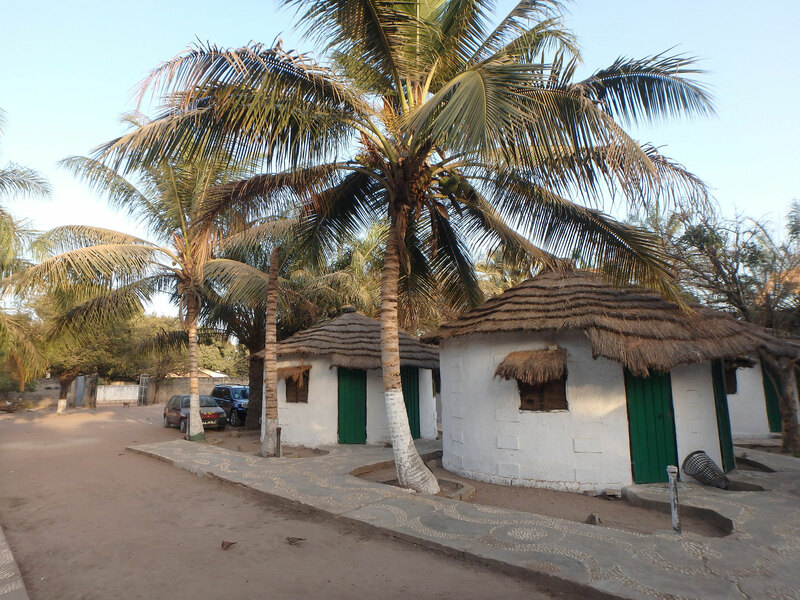 Nematulie Lodge, Brikama - 800 D for a double room, 150 D each for breakfast. Bwiam/Foni Ding Ding Lodge, Bwiam - 500 D for a double room - very peaceful, good value. Contact information for bookings can be found on their website. 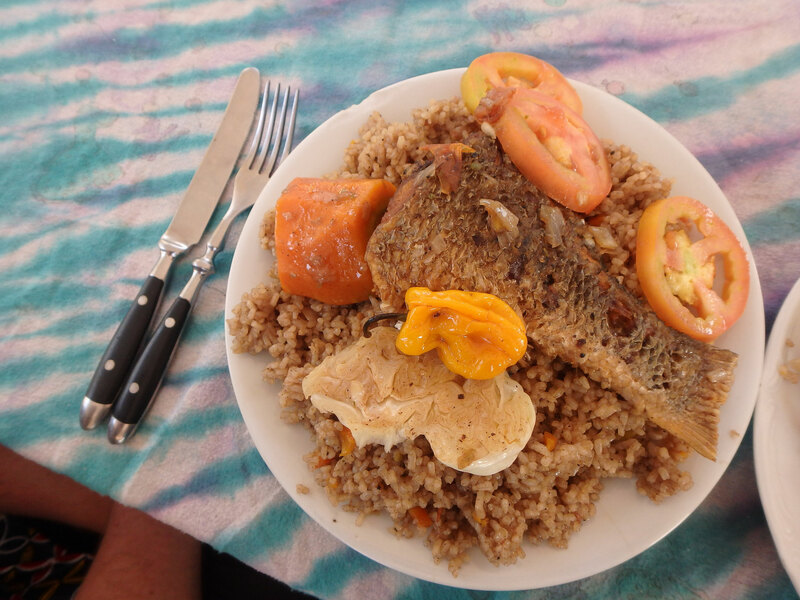 I wanted to make a special mention for the Oregano restaurant on the road north towards the craft market/Serekunda. The giant sandwiches and chips are probably better than the local dishes, but the young girl who served up both times we went was exceptionally friendly. They also have wifi when the power is working and it's a good place to hide from the sun around lunch time. Food is between 70 D and 150 D a plate and very filling. 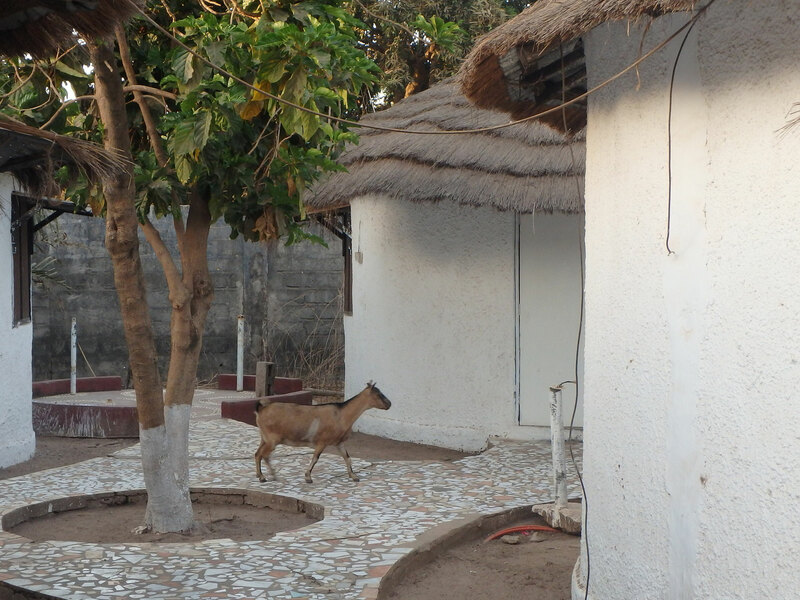 Guide book - The Gambia Bradt Guide by Philip Briggs (updated by Simon Fenton). I'd become rather snobby about travel guides, but this one has been invaluable. It is intelligently written with an awareness of the traveller's privilege I have often found lacking in other books.